Every year, the bible of the South (aka. Southern Living) puts together an amazing idea house. The home is usually located in an up-and-coming neighborhood or town and features fabulous designers from the South and beyond. The 2016 idea house is no different. Located in Mt. Laurel, just about a twenty-five minute drive from downtown Birmingham, is this year's idea house. The home is in low country style and features a spacious porch, large plantation windows and shutters, beautiful landscaping, and transitional interiors. A few weeks ago, I spent a girls' weekend taking in Birmingham and all that the idea house had to offer. The home itself is stunning. While it is definitely spacious, it wasn't sprawling and unlivable. In fact, someone has already purchased this year's home as well as many of its interior furnishings. When you walk in the door you are greeted by a stunning foyer that opens to a formal dining room on your right and a not-so-formal living room on your left. While the living room is ever bit as beautiful as a formal space, I can definitely see it being used as a family room. It has two sitting areas, gorgeous bookcases, loads of Audubon prints, and some of the most exquisite lighting I had ever seen. Task lamps are in, y'all! This room is just off of the serene master bedroom. While I wasn't overly impressed with the master bed, I did love the master bath. The coolest part? Custom wooden doors everywhere you turned including leading into the shower. The dining room was chock full of antiques (don't even get me started on the amazing crystal chandelier), and I think this was my favorite room in the home. While definitely elegant, I loved the pattern play and the use of a traditional antique table with more modern chairs. The colors were rich yet playful, and I can see this room being an inspiration room for my own dining space. I have to say that I didn't love the kelly green kitchen, and the tented breakfast nook/family room made me a pinch nervous - southern food is much too rich for fabric draping every corner off of the kitchen. The upstairs bedrooms were quaint and colorful which made me excited to dig into my own renovation. We live in a bungalow, and this idea house definitely embraced walls. I'm thankful to see open concepts dwindling just a little bit over the cozier feeling of nooks and crannies. How yummy is the bedding in this bedroom? And the desk space in the pajama room was pretty much a dream. While I loved exploring this home, I must say that I didn't leave with any useful (and affordable) ideas. I've been to a Southern Living idea house before; there was one in Senoia just south of Atlanta. I went with a girlfriend, and we made the day of walking around the town and enjoying the Senoia home. While I definitely didn't prefer the Senoia idea house, I did feel as though it was full of immediate ideas that I could take away. I even went home and immediately purchased an Old Try print I had seen in the Senoia home. 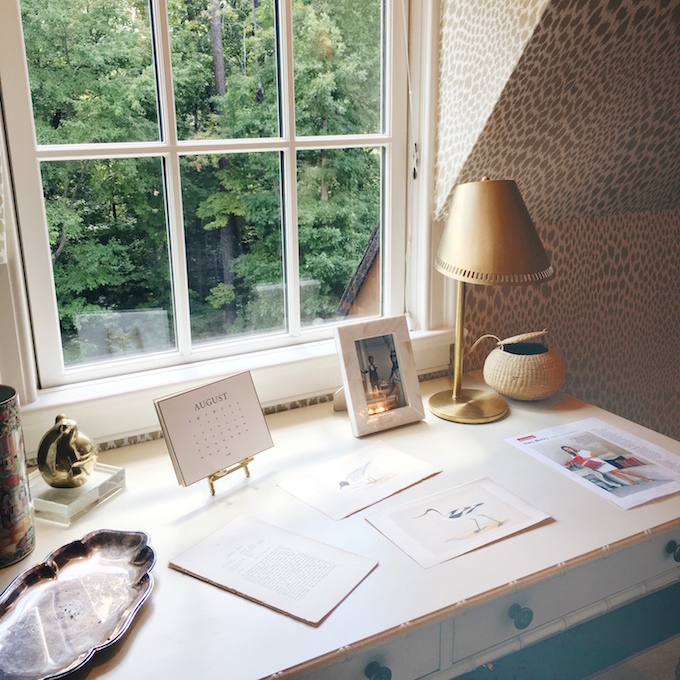 If anything, from visiting the 2016 Southern Living Idea House, I learned that color is queen, walls are king, and patterns are just as modern as they were when our grandmothers were decorating. If you're interested in visiting the home, find all the information you need here.